Once, titans strode the earth. We need not look all the way back to before the Renaissance to see that this was so, for a quick glance at the names above the title of this movie are confirmation enough�Richard Burton and Peter O'Toole here were movie stars of such epic proportions that the mere sounds of their sonorous voices were enough to keep audiences mesmerized. (O'Toole's recent late career turn in Venus further validates his iconic status; Burton alas is no longer with us.) If movies were judged by elocution alone, this one would be as lauded as Citizen Kane�it may not otherwise belong in that lofty company, but what's here is viscerally and intelligently entertaining, the sort of movie we hunger for but is likely to get edged out by too many special effects. The 1960s brought an odd, late flurry of history plays�it almost feels like the dismantling of the British Empire needed one last great gasp of its past, with movies like this one and A Man For All Seasons. And curiously enough this one came from across the Channel�Becket is based on a play by Jean Anouilh, translated and adapted by those in the country where it is set, for this is the story of Henry II, great grandson of William the Conqueror, and Thomas � Becket, his great and good friend, faithful consigliere, and ultimately sworn enemy. (If you're not up on your medieval history, I promise not to give away secrets; but the prologue of the film, with Henry speaking to Becket's tomb, is kind of a tipoff. Taking on a man who controls a standing army, even if you are on horseback, isn't, we learn, much of a career move.) The film presents the two of them as a couple of rowdy, whoring drunkards who just happen to have all of England at their disposal�it's like the king and his best pal are fraternity boys aging out, to the tut tuts of the elders at court. Henry's ambitions are grander than merely wine and women, however�there's nothing like a good war to get a monarch's blood flowing, and Henry prepares to take on the hated French. Alas the treasury doesn't have enough on hand to fund his excellent adventure, so Henry must tax the Church to fund his war. Fear not, for this film is much more than a dry exercise on the rights of church versus state. It is in fact principally an opportunity for the two leading men to show off the goods, and zounds, do they ever. O'Toole as Henry is all appetite�he's charming and rakish and forever on the make, a man with everything who wants only one thing: more. And one of the pleasures of watching an O'Toole performance from this period is his crazed choices in line readings�you're never quite sure on what syllable he's going to EXPLODE and it all sounds so deliriously wonderful. (The only rightful heir to this kind of lunatic diction is Christopher Walken.) 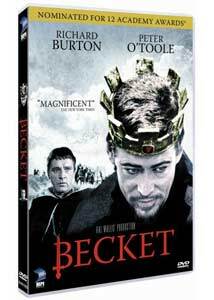 And as Becket, Burton essentially functions as O'Toole's conscience, a man with a lacerating wit who is most withering about himself. It's Thomas � Becket as Angry Young Man, a Jimmy Porter for the Middle Ages, and Burton was the master of this kind of man, alienated and distanced from everything, living out his life more in sorrow than in anger. The film almost invites a Freudian reading, as the homoeroticism between Becket and Henry is unmistakable�when the King emerges from his bath, it is Becket who towels him off; and when the monarch moons, "I don't want to be alone tonight," he well knows the answer he'll hear: "I'm here, my Prince." It's Henry's bright idea that leads to them falling out of love, essentially�he installs Becket as Archbishop of Canterbury, so now Thomas' loyalties are not exclusively to the throne. And despite all their jousting and harsh words, Henry still can't quit him: "No one on this earth has ever loved me except Becket." Director Peter Glenville does an unexceptional job, given that his chore is essentially to stay out of his actors' way; you sort of wish that James Foley had displayed similar restraint on another project driven by its cast and its script, Glengarry Glen Ross, rather than slapping on some empty pyrotechnics. There's a bit too much merrie olde period stuff for my taste, and Glenville has a weakness for ceremony; the movie runs close to two and a half hours, and frequently one longs for him to cut down on all the processionals and formalities, for goodness knows just a bit on screen goes quite a long way. There are of course others in the cast, most notably John Gielgud, playing out every English stereotype as a fussy, effete French king with a preposterous hairpiece; he speaks in as stentorian a manner as the two leading men, but curiously enough, in a cameo, the Pope speaks with a heavy Italian accent. But whenever anybody else is on screen, you can't help but feel like it's marking time until O'Toole and Burton cross swords once again. Fear not; they will, and most gloriously too, my liege. Image Transfer Review: The film has been recently restored, but time has been unkind; some of the greyness that predominates was intended, but more of it looks like the bleeding out of color over the years, the kind of thing that's endemic to color films of this period. The restoration is sharp enough, though, for us to see what was shot on location, and what looks now like mangy process shooting. Audio Transfer Review: You won't miss a syllable, thankfully; the 5.1 track may be a bit overmixed, and I preferred the 2.0 alternative. Extras Review: There may be no better raconteur than Peter O'Toole, and he's in fine fettle on the commentary track, interviewed by Mark Kermode. O'Toole remembers the shoot with astonishing clarity, and he's not afraid to dish; he's also very funny about the play itself, which he acknowledges is great as drama but balderdash as history, and feels obligated almost to provide the errata for teachers who unwisely show the film to their students and pass it off as the genuine article. In a 2006 interview (12m:23s), composer Lawrence Rosenthal sits at a keyboard and goes over his work on the film; editor Anne V. Coates does the same (07m:12s), and compares this to the footage she cut on a very different, less dialogue-driven O'Toole project, Lawrence of Arabia. You can see the effects of hard living in two archival Burton interviews, ten years apart�in 1967, in conversation with Kenneth Tynan (13m:58s), Burton discusses his debt to Gielgud, and the notion of himself as an actor apart from others; in 1977, with Ludovic Kennedy (12m:23s), Equus is a principal topic, as is Burton's drinking. And along with an original trailer and a TV spot for the film's re-release, there's a stills gallery, featuring posters, lobby cards, and black-and-white candids from the set. Also, whoever prepared the subtitles needs a refresher course in the use of apostrophes, for there's a whole lot of "When you Norman's invaded" and the like. Larger than life performances these days almost always spill over into the buffoonish, and so to see O'Toole and Burton work on such a grand scale and to feed off one another without ever giving over to parody makes this a master class in a dying art. The inside baseball of medieval politics may not galvanize you, and there are a few royal processionals too many; but there's so much in this film that's divinely old-fashioned that it's easy to recommend.